Returns true if a misuse of the stream has occurred. Return iterator to first byte to be parsed. Return iterator to last byte (not part of stream). Returns the first character in the buffer. Does not check for errors. Return true if no parse errors. That is, NOT BAD. Parse text into an stl style string. Parse a null terminated array of character. Discard the first character in the buffer. Set or clear the bad flag. Return bytes left to be parsed. Remove leading characters from the Stream that are found in the specified character set. Remove leading blanks from the input stream, then compare the stream contents with a specified string. If there is an exact match, then move the stream pointer past the string and return true. Skip whitespace in the input stream. 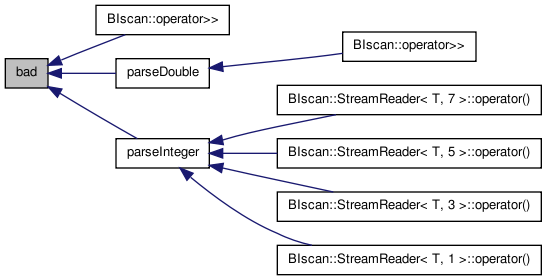 One of a family of overloaded functions that returns a stream whose type is based on its parameters. A Representation of a stream of bytes that can be parsed quickly. See its related operator >> functions. The Stream does not own the bytes, and so they must not be changed or destroyed while the parsing process is in effect. The purpose of the Stream class is to simulate sscanf using C++ style syntax and not to create an alternative to the istream class. Streams are an extensible form of sscanf in that you can add your own operator>> functions to do things not originally included in the design -- which is basically targetted at numbers and strings. Don't construct objects of this type directly, instead, use the stream() family of functions to interact with Streams. Their job is to construct streams from parameters that identify the type of the stream. At its heart, a stream is a couple of pointers that refer to the as yet unparsed stream of data. The operator>> methods do all the work. // text. The variable, someInt contains 99. // a string followed by white space followed by an integer followed by a string. // you should get here because "glarf" won't parse to an int. When you use BIscan::Stream to extract a character, you will get a character not an eight bit signed integer. An unsigned char, however is treated as a number, not a character. Definition at line 584 of file BIscan.h. Definition at line 666 of file BIscan.h. Definition at line 762 of file BIscan.h. Definition at line 775 of file BIscan.h. Definition at line 756 of file BIscan.h. Definition at line 778 of file BIscan.h. Definition at line 758 of file BIscan.h. Definition at line 690 of file BIscan.h. Definition at line 708 of file BIscan.h. Definition at line 802 of file BIscan.h. Definition at line 784 of file BIscan.h. Skip leading whitespace and parse until the end of the stream or the first whitespace character is found. Since the result is a std::string, no nul is appended. the size of the string parsed. [out] s the array of characters to hold the parsed data. Definition at line 961 of file BIscan.h. Skip leading whitespace and parse until the end of string or the first whitespace character is found. the number of bytes read into array (not counting the null null byte that will be appended). [out] array the array of characters to hold the parsed data. Note that this must be an array not a pointer! Definition at line 919 of file BIscan.h. Definition at line 769 of file BIscan.h. b the new state of the bad() flag. Definition at line 765 of file BIscan.h. Definition at line 772 of file BIscan.h. true to indicate that a character within the character set was actually found. [in] first The first byte of a vector of characters that contains the character set of interest. [in] last The last byte of the vector. Leading whitespace is not skipped unless it is contained in the character set. Definition at line 829 of file BIscan.h. true only if the stream contains s.
[in] s the string to skip over. Definition at line 877 of file BIscan.h. Definition at line 820 of file BIscan.h. The Stream returned does not have a copy of the stream data, only a pointer to it. You must not destruct or change the input pointer's data until parsing is complete. Definition at line 1729 of file BIscan.h. This function converts an stl style string into a Stream. Definition at line 1746 of file BIscan.h. Definition at line 1713 of file BIscan.h. This function converts a C style string into a Stream. Definition at line 1698 of file BIscan.h. Definition at line 660 of file BIscan.h. Definition at line 659 of file BIscan.h. Definition at line 661 of file BIscan.h. Definition at line 658 of file BIscan.h.